For over 40 years Holbrook Travel has been serving the needs of teachers, students, academic institutions and nature lovers - by providing a true connection between travelers and their destinations. The Holbrook team is comprised of scientists, researchers, educators and travel specialists that form the core of a unique family owned and operated business. Source Type: Aircraft and land based travel for 311 travelers with destinations to Central and South America. and Green Earth Gardens S.A. 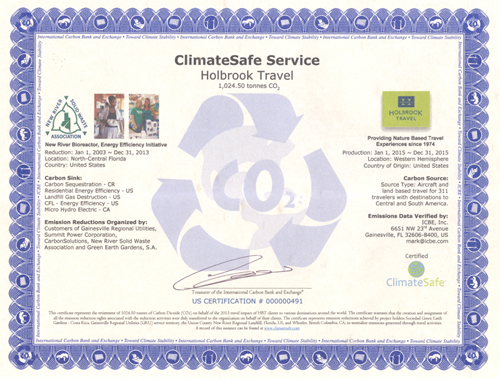 The ClimateSafe Certification mark guarantees that a product, service or event is actually Carbon Neutral.